On pace to finish the 2015 season at least 10 games better in the win column than last year, the New York Mets overtook the Washington Nationals after the All Star break and captured their first NL East Championship since 2006. 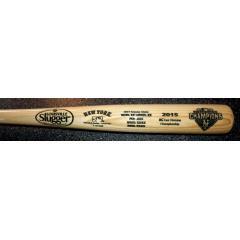 This full size bat by Louisville Slugger was created to celebrate the team's great one-year turnaround and return to post season play. Each bat is laser engraved with team and post season logos, and the final 2015 regular season record. This is a limited edition collectible that every Mets fan will love. Get yours before they are gone. Due to the limited nature of this item we must charge your credit card for the full amount immediately upon taking your order. This policy ensures we reserve a bat for you. We will confirm your order by Email. This bat is not game used. Please allow 2 to 4 weeks for delivery.